Alligators are amazing creatures. I live near a wildlife preserve and I have heard of several alligators that live there. Fishermen tell stories of their shining eyes peering at them during the night. 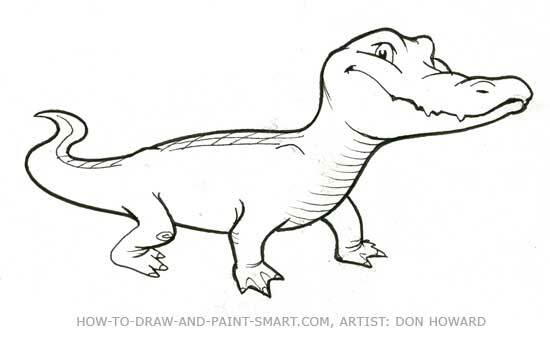 I first got into drawing alligators when I began illustrating chldren's books. An author came to me and told me his story about a couple of alligators named Charlie and Minnie who lived in the bayou and were visited by a martian. Several years later I was approached by a writer who wanted to make a cartoon about alligators. 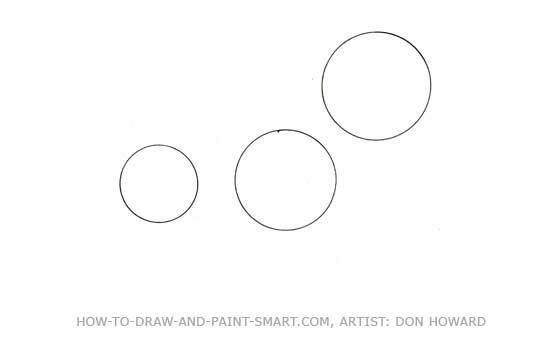 I asked Don Howard, who did this lesson, to design the characters for the cartoon called Me and Jessie D. Don created the character designs for the cartoon and I managed the animaton production. 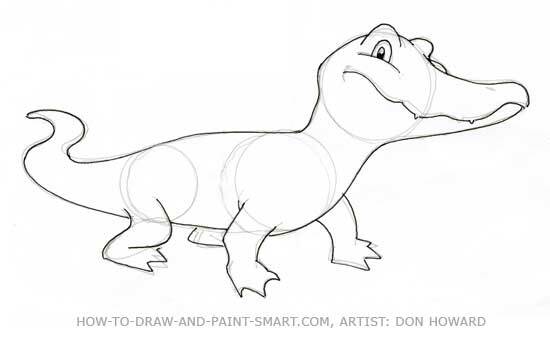 The alligators in that cartoon were named Boo and Jessie D.
Now let's get started with the "How to Draw Alligators"
Draw three circles to place the alligators head, shoulders and hips. 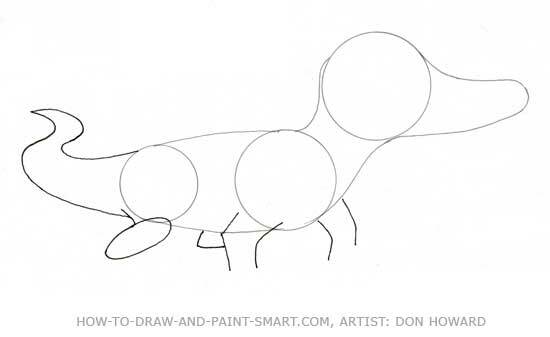 Draw the alligators snout and connect the major body areas with curved lines. Give your alligator a tail and some legs to stand on. Draw a crooked mouth, some himps for the eyes and eye brows and give your alligator some feet. 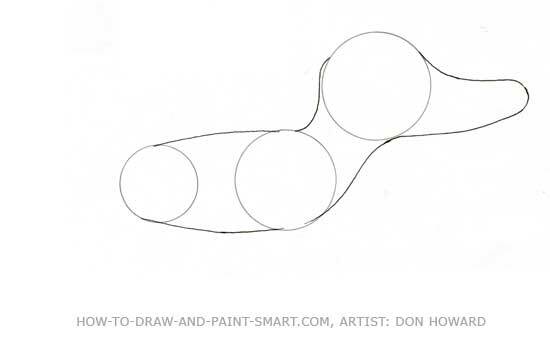 Refine your alligator drawing and erase the shapes you usedt to establish his proportions. 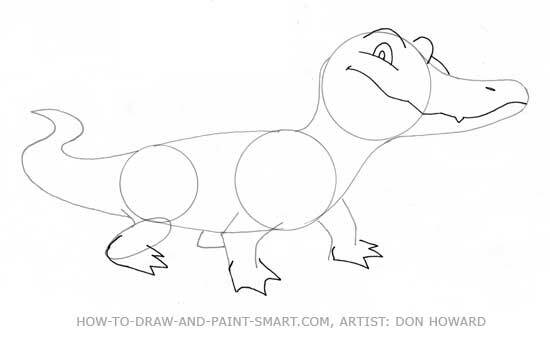 Complete your alligator by detailing his skin and refining his outline. you can use a marker or dark pencil. Simple cross hatching helps indicate the ridges on his back side. Alligators also have wrinkles in their skin around the joints. Adding a nostril and some lines on the snout helps compete his face. Where can I learn more about Bears?